Safari 4 came out of beta today complete with all the features that its beta users have come to appreciate. However, Safari 4’s final user interface is slightly different than in the earlier versions that we've seen. 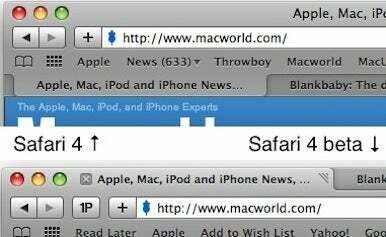 The most controversial new feature of Safari 4 was the placement of tabs on the top of the Safari browser window instead of below the bookmarks bar. At first, I was against this new UI quirk, but the more I used the Safari 4 Beta the more I liked the placement of the tabs on top of the window. Sadly, in the shipping version of Safari 4 tabs have returned to their traditional place (compare the two on the picture above). The other feature that got some people’s knickers in a twist was Safari 4's progress bar—or lack thereof. Safari 3 would show a blue bar that filled up the address bar as a page loaded, whereas the Safari 4 beta used the same progress indicator that Mobile Safari uses on the iPhone: a small whirling circle in the rightmost part of the address bar. Safari 4 (non-beta) employs a fusion of the two: the whirling icon is still there, but a solid indicator appears as a webpage is loading that says ‘Loading…’ just so you know. You’ll also notice that the RSS button that appears on some sites has gone from a nice blue hue to a metallic color that matches the coloring of the Safari window itself (in the image Safari 4 beta is on the left, final is on the right). These are just a few of the surface details that I’ve noticed are different during my first few minutes with Safari 4. I’m sure there are more to discover, and if you find any let us know in the comments.